Johannes Verhulststraat 150 hs AMSTERDAM - Peter Bruin Makelaardij o.g. b.v.
Light and bright triple groundfloor, semi-furnished or furnished 5 bedroom apartment, with 4 bathrooms and a spacious garden. This completely renovated apartment of approx. 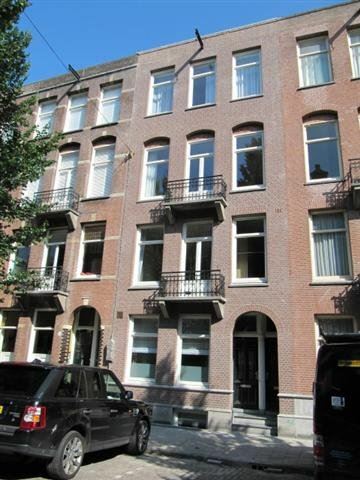 240 m2 , divided over three floors is located in the popular Old South. Around the corner you will find the Vondelpark and the Cornelis Schuytstraat for restaurants and high end shopping. Entrance, large open living room with design gas fire place. Dining room with fully equipped open kitchen. From de dining area are large double doors that open toward the terrace and garden. Three bedrooms. Master bedroom and bathroom with bathtub and shower. Second bathroom with shower and toilet. Seperate third bedroom. Two spacious bedrooms with two bathrooms equipped with shower, sink and toilet. In the hallway a separate guest toilet and utility room with washer and dryer. Oak wooden floors throughout the apartment. Available for longer periods with a minimum of 6 months. The apartment can be rented fully furnished for €500,-- extra per month.